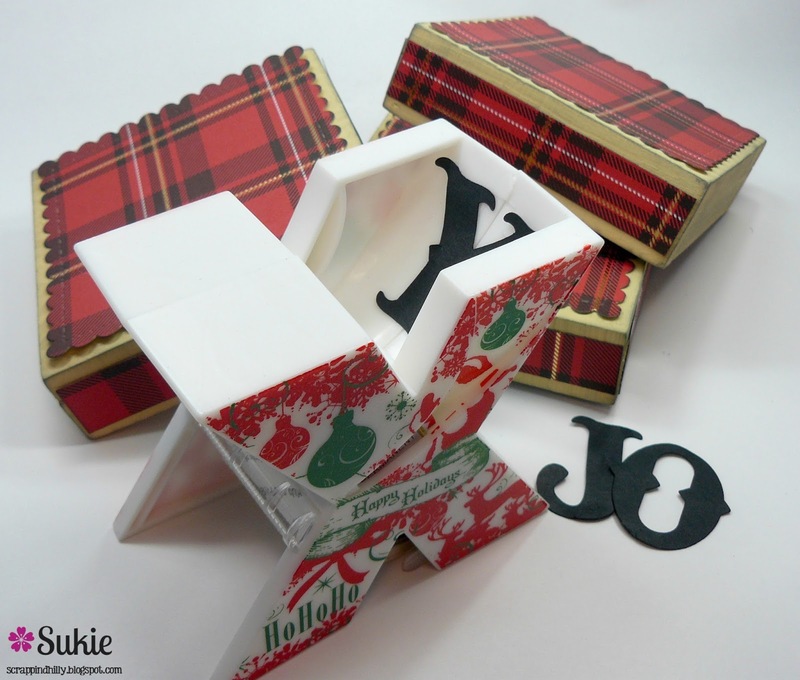 Hello, this is Sukie with a fun home decor project for gift giving. The holidays are full of get togethers and festivities so why not have a homemade gift ready for that special someone you love and appreciate. It certainly takes the pressure off when it's one less item on the shopping list. My project started with some mismatched wooden blocks. 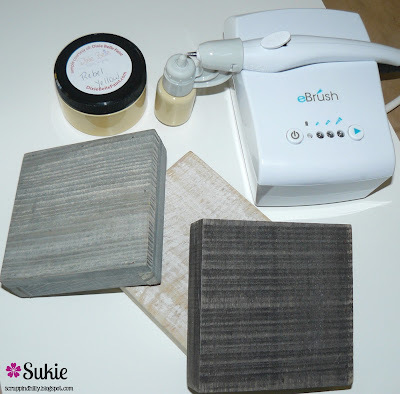 I used my eBrush, the Siphon adapter and some gorgeous Dixie Bell Chalk paint in Rebel Yellow. I mixed in the paint and a bit of water in the glass bottle to use with the Siphon adapter. The end result of my painting was a beautiful, chalky, matte finish with great coverage. There was no priming required with the Dixie Belle Chalk paint. 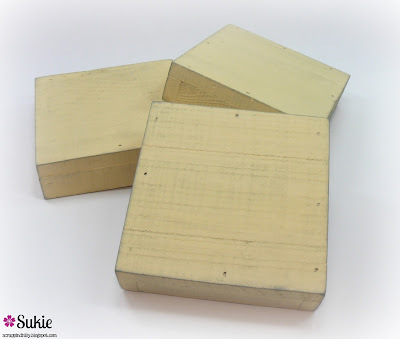 I sanded the edges of the blocks for a vintage appearance. 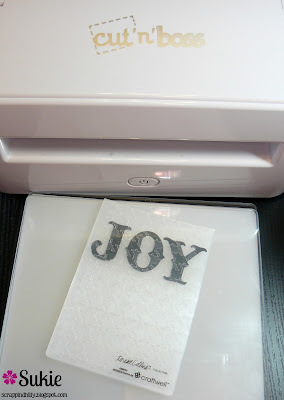 I used my electronic die cutter to cut the "Joy" phrase out twice and embossed one set of the phrase. The Teresa Collins Preppy Houndstooth A6 embossing folder provided the phrase with great texture. I added some holiday paper around the edges and front of the blocks from the DCWV Christmas Plaid Stack. I used my Christmas themed Xyron sticker maker to run the bottom layer of the letters for easy adhering. Some foam tape was placed between the top layer and bottom layer of the letters for added dimension. 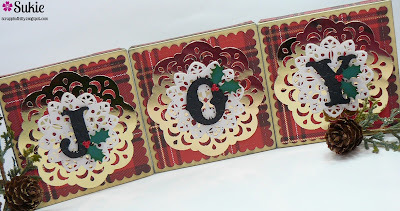 A gold doily from the Paper Lace Stack was layered under a white doily. 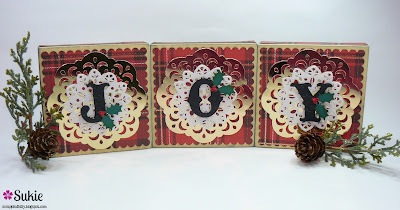 Next I adhered the Joy phrase and accented each letter with die cut Christmas Ivy.